Not to be missed - three leading Artists will display their works of art being Elisa Wright's stunning Watercolours, Zoe Graham's amazingly clever all genres of Mixed Media and Robyn Ross's hauntingly evocative Mixed Media style. Now a resident of the Misty Mountains town of Ravenshoe, the highest town in Queensland, Elisa is a Watercolourist and is at one with nature allowing the peace and tranquility she requires to paint with the result of sensitive, softly coloured watercolours which arouse feelings of serenity in the viewer. Her majestic skyline, whirlwind seascapes and misty rainforest waterfalls are typical of her unique evocative style. Naturally talented, Elisa obtained formal watercolour skills by attending workshops conducted by professional watercolourist, Reg Cox, in Melbourne over 28 years ago. 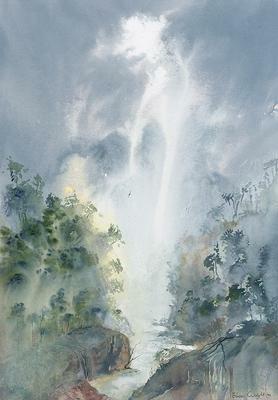 Since then, and relocating to Cairns, North Queensland, has exhibited in galleries in the North as well as having her own exhibitions with regular sales success internationally including many awards in her particular genre of watercolour. To view Elisa's originals and 14 reproductions please view Elisa Wright's website - elisawrightwatercolourist.bigcartel.com and facebook.com/elisawrightart. She has sold over 600 of her most successful print "Rainforest Falls". Elisa and her brother, Robert Balas, from Sydney, produced a poetry book "Once Upon a Place Twice Upon the Moon" with Elisa painting to Robert's poetry. 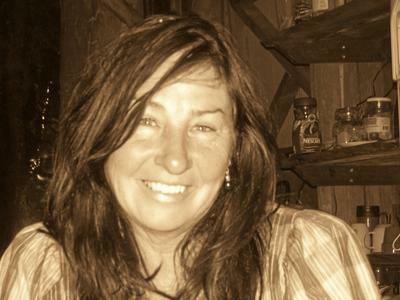 Relocating to the Atherton Tablelands in 2002 she completed her Diploma in the Visual Arts and Contemporary Craft and organised Community 'Art Attack' weekends. Elisa's watercolours can be viewed in Ravenshoe at 'Gallery on Grigg' and at 'The Barn'. Zoe is a country girl, growing up in Bathurst NSW , & her love of the bush is evident in her works. Zoe loves colour & texture and is always experimenting with new techniques to keep fresh. One of her early private art tutors taught her to not be confined to one genre. Zoe has achieved this with being able to jump from portraits to landscapes modern & traditional to totally abstract works. Zoe’s humanitarian nature has seen her involved with many committees and fundraising for a number of community groups and charities. All very time consuming, but when you have such a passion for Art ….. you will always find the time. Zoe has many exhibitions & over the past three years she has exhibited & sold works at The Sydney Royal Easter Show. She does a lot of commission work & her Australiana series has been very popular with overseas travellers. Zoe loves people and loves to travel, drawing on all these experiences for inspiration. Music has also had a huge focus in Zoe’s life, having owned & operated 2 music stores & marrying Peter, who was working in Radio & the entertainment business … is most probably why Zoe names a lot of her paintings after songs. There is always music playing as she paints.